With the popularity of tiny house plans, you might find yourself wondering how anyone could live in a tiny house plan. But don’t be fooled! Tiny house plans have more to offer than you might expect. While some homeowners consider them to be just the right size for a secondary home or weekend getaway, others build tiny homes for their permeant residences. Whether you prefer a tiny home due to its minimal home maintenance or you are concerned about minimizing your carbon footprint, tiny house plans are the ideal solution for many homeowners. Below, we described five of our tiny house plans presenting an example of the various architectural styles and features you can find with tiny homes. 052H-0032: If you have a piece of land deserving of 360 degree views, this unique tiny house plan may just fit the bill. Surrounded by glass windows and doors, panoramic views are provided all the way around this open floor plan. 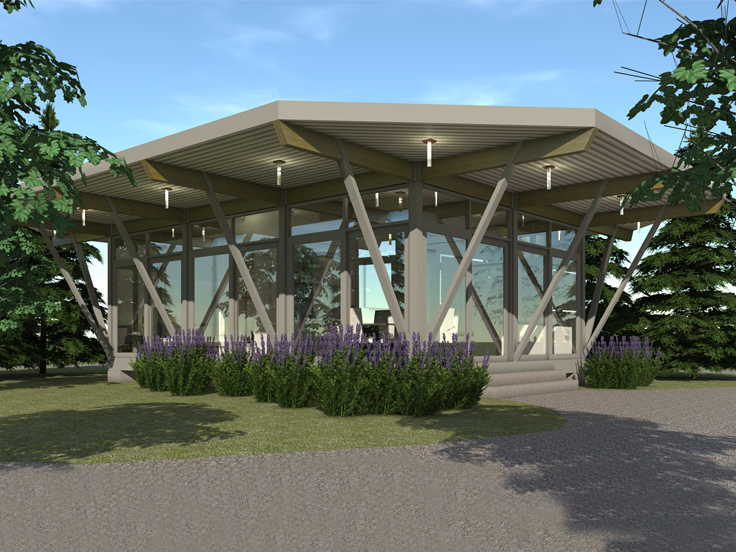 Plus, the roof overhangs the exterior walls to protect and shade the outside space as well. The living and dining areas share space with a kitchenette making it easy to enjoy conversation with guests while meals are prepared. Two bedrooms share a full bath and are tucked behind the gathering spaces for privacy. Wherever you plan to build this tiny contemporary house plan, waterfront or mountaintop, you will enjoy looking good in this unique design. 066L-0002: This tiny log house plan works great one a wooded lot with its log exterior. The floor plan makes efficient and practical use living space. All the necessities for sleeping, eating, and relaxing are met in a cozy and comfortable way. A rustic fireplace echoes the beauty of the forest while a kitchenette and full bath deliver modern conveniences. The studio-style floor plan combines the sleeping area with the living spaces ensuring you’ll enjoy the warmth of the fire all through the night. Designed with the outdoorsman in mind, a friendly front porch offers shelter for enjoying sunsets and starry nights, or grilling your favorite dinner after a day of hiking in the woods. 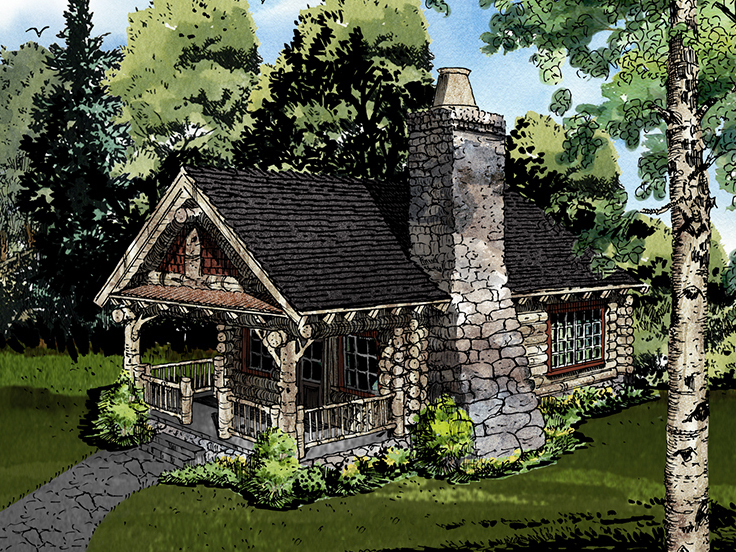 Simply rustic and practically designed, this tiny log house plan delivers peace and solitude for those who want to get away from it all. 072H-0186: Here is a tiny house with an emphasis on modern design. A front wall of windows spills natural light into the main living and dining space while delivering stunning views of the surrounding landscape. Check out the L-shaped kitchenette, ready and waiting for your inner chef. Two bedrooms offer closets for storage, plus there is a coat closet at the front entry. The front porch provides plenty of room for chairs where you can sip lemonade and enjoy the gentle breeze. Whether you are dreaming of downsizing or want to build a vacation paradise, this modern tiny house plan won’t disappoint you! 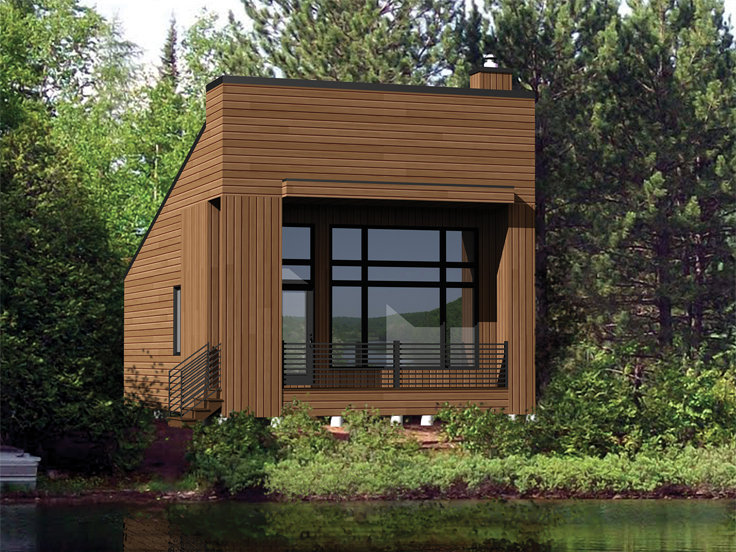 027H-0462: This tiny house plan would make a great home for retirees looking to downsize. A handsome multi-material exterior delvers eye-catching curb appeal. Inside you’ll find all the necessities for comfortable living. Two bedrooms are separated by a full bath with a laundry closet. The open floor plan provides space for dining, lounging, and preparing meals. Windows drawn natural light indoors and encourage you to enjoy the view. 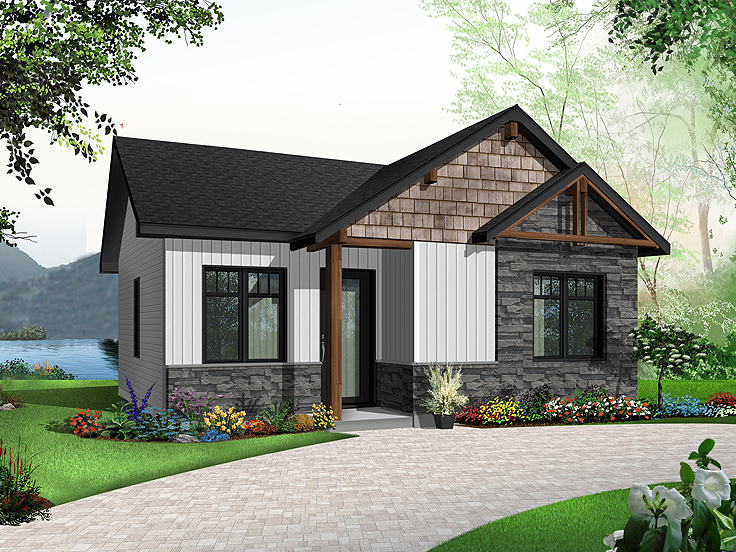 Efficient yet comfortable, this tiny house plan is suitable for year-round living or for use as a guest home or in-law cottage. Have we peaked your interest? If so, please browse our entire collection of Tiny House Plans.